Our date last night was our 4th Annual Opera Outing, this time to see Otello. In years past, we’ve seen Rigoletto, Romeo and Juliet, and La Traviata. 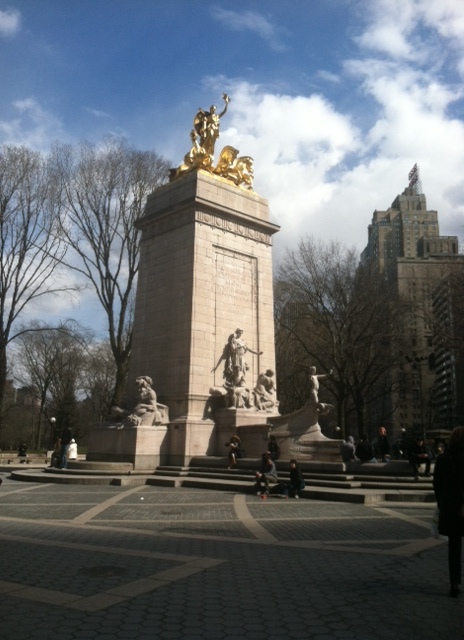 We like to go in March around his birthday or in April, as the weather gets nicer and opera season is underway. 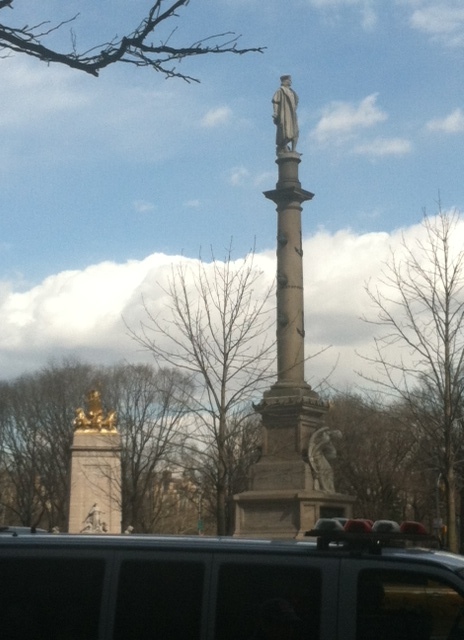 We drive into Manhattan and have a nice dinner, then go to the performance. Usually we go on a weekend, but this year we decided on a mid-week trip (Translation: I waited too long to get our tickets and Wednesday night turned out to be our best option. Husband is a teacher on spring break this week, so the timing worked out. Phew!). The mid-week opera excursion was quite pleasant. The restaurants around Lincoln Center were busy but not crazy, and the crowd seemed more of the after-work local crowd than the tourist crowd. Also, security at Lincoln Center was lax, and I mean this in a good way. Last year on a Saturday night, a security guard scolded me for taking pictures in the Opera House with my phone; however, this year people were snapping photos left and right without consequence. I assume this was permitted because it was mid-week– maybe less security guards milling around. Feeling a bit criminal, I joined in and attach my pictures below. Have you been to the opera? Any opera fans out there? 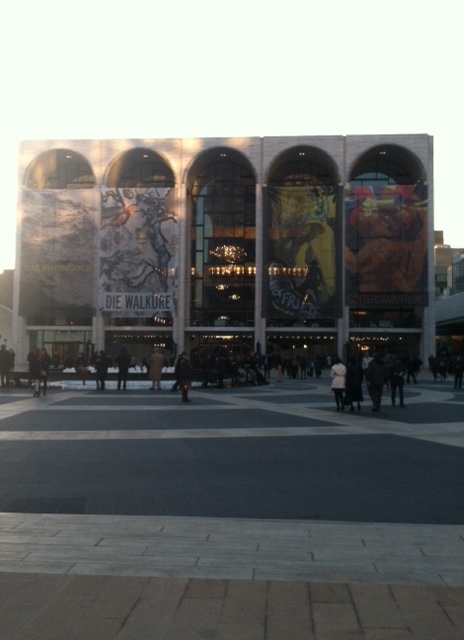 It seems people either love it or hate it, but if you get the opportunity, I highly recommend shelling out the cash and experiencing Lincoln Center and The Met at least once in your life. Practically, it’s super easy. You can park underneath the building (I think we paid about $30 to park), and the Met’s Website is fairly user-friendly. Our favorite feature on the website is the ability to pick your seat from a seating chart of the theater. We make sure to pick aisle seats for husband’s long legs, and so we can dart out at the end during the applause in order to beat traffic out of the lot (classy, right?). Also, in front of every seat is a tiny screen which can be seen only by you, which they call “Met Titles” where you can read the text of the opera during the performance. It’s subtle and not distracting. I tried to take a picture for you, but it’s hard to see. I’ll attach it anyway. Besides those practical aspects of an opera outing, creatively, of course, it’s amazing. I don’t know much about music or voice or opera, but I love hearing a soprano voice that is so beautiful and perfect that it sounds like it must be from an instrument instead of a person. The tenors and baritones are strong and powerful. Obviously the music is lovely, and watching the orchestra is also interesting. Whether experienced in opera and music or not, you’ll see, and feel in your gut that you are listening and watching something special. The best in the world perform at The Met. If you get the opportunity, it’s worth the trip. 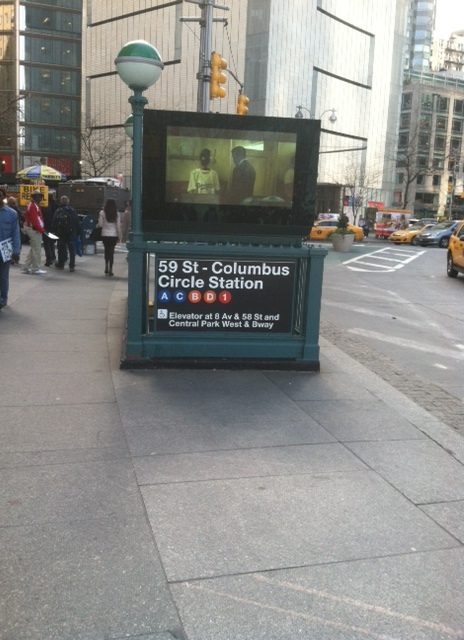 When did they put flat screens at the subway entrances? Chandelier in the lobby. Giant, sparkly, and beautiful. The Pretty Woman seats. 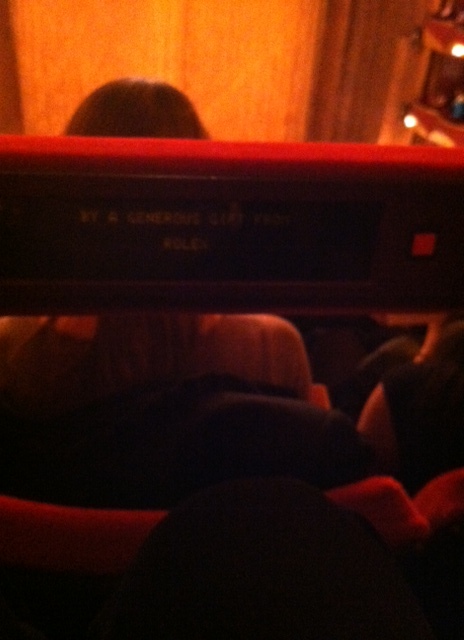 Box seats are sometimes labeled “Obstructed View” despite Richard Gere’s preference for them. Horrible pic of Met Titles. You can choose your language, or choose to turn it off completely. I find the titles quite helpful. The Lobby from the Balcony level. You can eat during the intermissions right in the lobby. Staff times it perfectly. 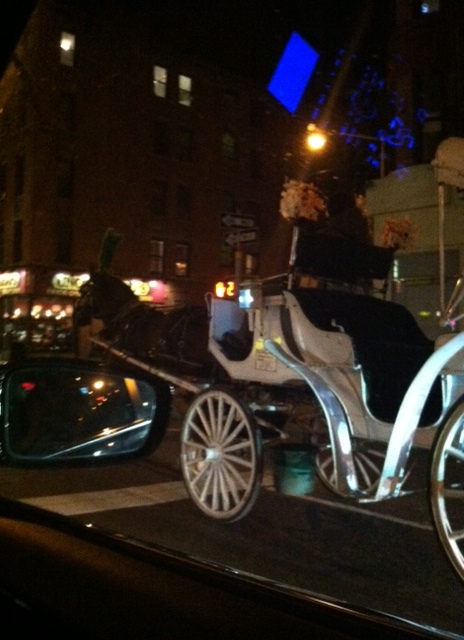 Horse and Buggy in traffic on ride home. I confess that I’m not an opera fan, mostly because of a lack of patience and partially being opposed to dramatic vibrato (it takes a pure sound and smears it, I think, unsophisticatedly). Those little screens would have certainly helped though! 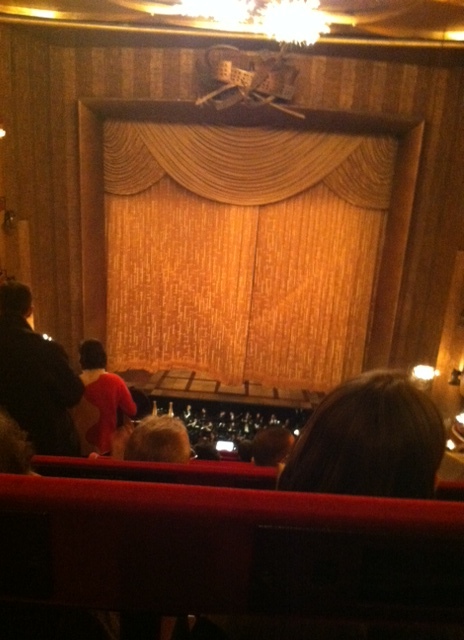 If I remember right, some of my sales tax dollars around here subsidize the opera I’ll never go to. That’s fine. Folks with fancy pants get to go see them and folks without (or who prefer not to wear them) get to feel sophisticated-by-proxy. Someone’s gotta wear those pants and I’m glad it’s you! Ha! Yes society needs some fancy pants wearers! I was upset to see you aren’t an opera fan, but I get it. Maybe the philharmonic or the ballet would be better suited for JT and Jess, oranges and oysters. Alas, I’m not a philharmonic or ballet fan, either. It’s not that I don’t appreciate it (I do). I just can’t quite sit still long enough. I’ve been so busy this week, didn’t get a chance to stop by. But I’m so glad I did this morning! What a great date night! 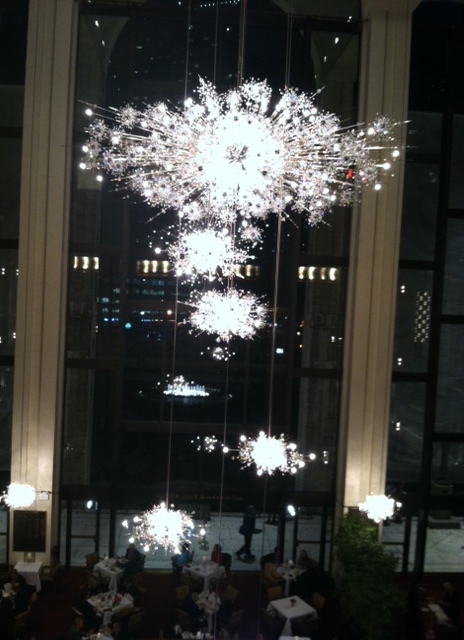 When I lived in Philly, my wife and I went to the Lincoln Center to watch a Shubert Piano Concerto. The experience was fantastic and we ate at Tavern on the Green. It was a night to remember, thanks for sharing this and bringing back some great memories. Aww what a nice date night! I went to tavern on the green once back in the day, and we sat a few tables from John Denver. My bro and I were less than thrilled, but my mom was very excited. RIP JD as well as TOTG…. That is interesting. He did his last concert here in Corpus Christi, Texas just before he died. I really enjoyed his Christmas Specials. “Fancy pants” – love it! 🙂 it wasn’t quite the Fur Ball, but still fancy! I did enjoy Othello but wanted to throw things at meanie Iago. Big jerk. O was an idiot for believing him. Damn Shakespeare and his misunderstandings!!! All the nice people end up dead! LOL!! That is so very true!!! Operas are awesome. The last time I was in the States, I attended one at the Ambassador Auditorium in Pasadena, California. What a wonderful night that was. There’s something about dressing up in elegant clothes, spending a ton of cash and enjoying a night on the town like that. Lots o’ fun! Agreed! We need a zombie opera (is it okay that I always associate you with zombies?). Loved loved your post today (zombie laws) Will visit and comment more fully later. That sounds like a perfect date. 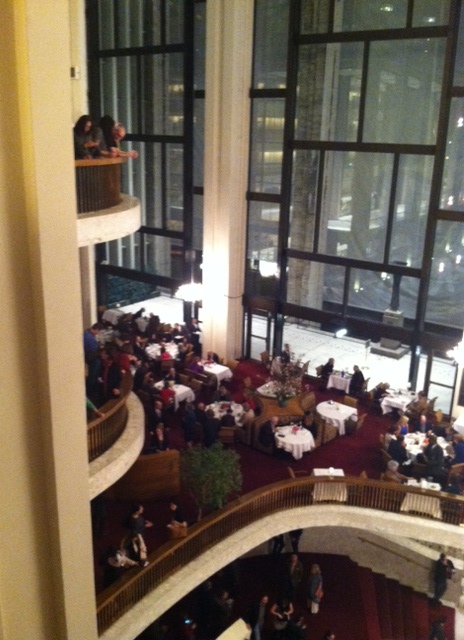 I love Opera, it is where all of the art disciplines meet. You have music, voice, acting, dancing, set design, costumes, hair and make-up. It’s amazing! What an absolutely delightful evening! It really was. We say that if we win the lottery we are going to buy a loft near Lincoln center and an opera package so we can hang there more often! It sounds like a really great night. 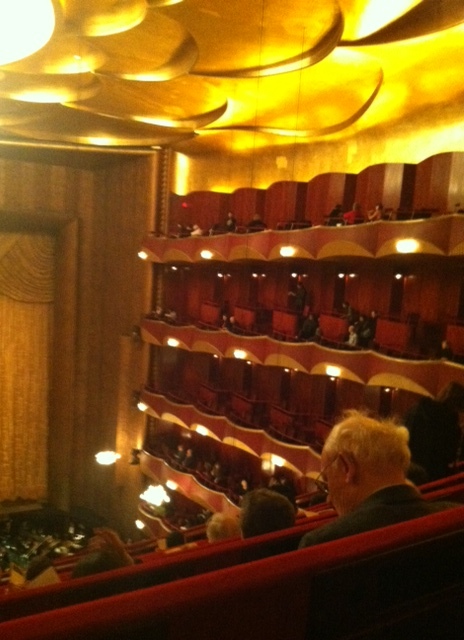 I have been to the MET (My family and I reside in north Jersey) many time but have never gone to the opera. I am not an opera person but do like Othello. Like your husband and I am a New York City teacher (English). Wow we have some things in common! Othello was a fun opera to watch. I wanted to throw tomatoes at stupid Iago everytime he walked on stage! Poor Desdemona took ages to die- just when you thought she was dead, she picked her head up and start to sing again! By the end I was begging her to please die!!! Thanks for reading and commenting.